Standardization pervades modern life to such a degree that we hardly notice it. From operating a vehicle to replacing a battery, its influence is at work behind the scenes to make our collective lives more convenient, more predictable, safer and easier. When we buy a light bulb, we know it will fit in the lamp socket. Standardization is a powerful concept that has established itself as a critical ally in managing progress. For panel builders and contractors, standardization is key for efficiency and productivity when working with medium voltage switchgear and transformer equipment. Despite standardization’s long track record of success in streamlining business, some work environments have yet to enjoy its full benefits. One example is the detailed and time-consuming work that key intermediaries such as contractors and panel builders have to endure as they attempt to select products, issue price quotations, place orders, assemble solutions, and ultimately deliver configured and integrated solutions to their end users. After all, these critical configuration and integration experts are held responsible for the on-time delivery of critical products so that end user projects do not get delayed. In fact, in today’s high-speed business environment, the time delays and complexities characteristic of the traditional pricing, ordering and configuration process are no longer a tenable business model. For this reason, forward-thinking suppliers of power systems for commercial and industrial power systems have leveraged breakthroughs in digitalization technologies to completely revamp how contractors and panel builders interface with the information, documentation and products they need to deliver. A new, streamlined end-to-end transactional business process –matching digital customer journey expectation – now makes it easier for partners and intermediaries to select, quote, order, and deliver power solutions for non-critical buildings and industries. In fact, the new manufacturer ecosystem being created – consisting of digital tools – should be designed to complement the in-house panel builder and contractor tools so that efficiency can be maximized. A seamless experience reduces concept-to-commissioning time for such products from months to weeks, with reconfiguration times dropping from weeks to days. Partner portal as an entry point – Contractors, panel builders and specifiers now have one online portal, with contents adapted according to their jobs, that enables a closer and higher priority manufacturer relationship. Specialized product trainings that help during the installation process, fast access to new product information and webinars that feature product experts all help to add value and quickly disseminate useful education. Available product offerings are automatically sorted and compared and the selected products are then easily submitted to a shopping cart from which a data sheet is automatically generated for the end user. Easier web-based product selection – The new web interface enables easy alignment of products to desired technical features and the quick side-by-side comparison of two similar products so that the most appropriate one can be rapidly identified. In this way, errors are avoided and product selections can be easily refined. Pre-validated reference designs – Off-the-shelf, pre-engineered, pre-tested and standardized architectures can be selected for non-mission critical transactional solutions (no reinventing and no redesigning required). It reduces delivery timelines and allows partners to get a precise and reliable delivery date, what is crucial to secure their projects. Quick quotation tool – The interface also provides partners with immediate pricing information and direct access to customer support, if required. The information, presented in local language, includes technical definition of the product, pricing in the local currency, and lead times. Even a complete medium voltage (MV) package can be selected and configured (i.e., switchgear and transformers) to accommodate the needs of the project. Clear documentation – As partners interact within the quotation tool, related product documentation is automatically generated and can be integrated to supplement partner project files. Thanks to the nature of the digitalized solution, the documentation is constantly updated. This documentation allows the contractor to manage the project drawings, for example, in a manner that facilitates creation of end user proposals. Instead of a manual assembly of solution-building critical resources, the linked systems assemble the documentation based on the particular partner’s choices and preferences. Simplified ordering – In the spirit of making day-to-day processes seamless, the order process is now integrated into the partner’s internal tool, directly linking the front office and the factory. The systems configured are pre-certified from a safety and local regulatory perspective. The validations of architectures by local utilities in the specific countries have been industrialized within the factories. When an order is received in the factory, the details of the order are standardized. It is also possible to track parcel from shipping to delivery. In developing this new end-to-end transactional system, the many pain points that contractors, panel builders, and integrators have experienced with configuring, proposing and ordering systems in the past have been addressed or eliminated. New innovations include Google map-like tools for quickly locating nearby partners, tools that expedite the development of specifications, tools that automatically generate one-line diagrams, and rapid order generation and quoting tools. To help partners through the medium voltage world, the implementation of a dedicated digital ecosystem is important. 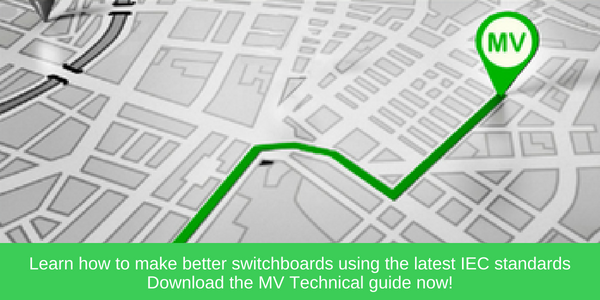 Download the medium voltage technical guide for information about how to make better switchboards using the latest IEC standards.